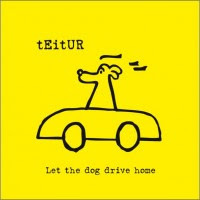 One of my favourite singer/songwriters Teitur returns with his new studio album titled "Let The Dog Drive Home". It is scheduled for release in Europe on October 4th (order here), and the the rest of the world in January 2011. Preceding the album a new single titled "You Never Leave L.A." will be released. 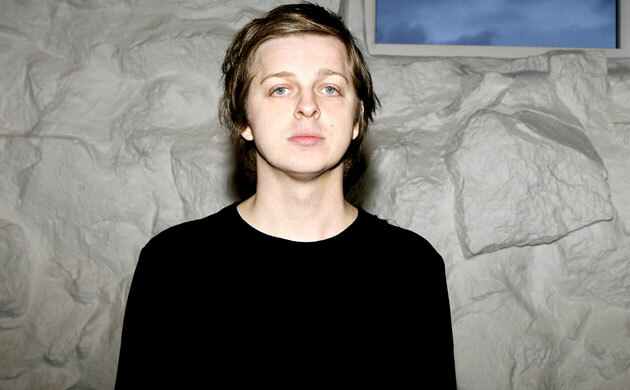 Teitur worked on arrangements on the album with Tróndur Bogason and it was recorded in Copenhagen back in March and on the Faroe Islands in April. Working on the album were: Derek Murphy, Mikael Blak, Nikolaj Torp, Tróndur Bogason, Jonas Bloch Danielsen and some strings, choir, clarinets and flutes. The album was mixed in Oslo by George Tandero. The track listing has changed by one song from what Teitur mentioned on his MySpace page back in February. Back in June Teitur Tweeted "Record comes out in October. Got a lot of setting up to do. We go on tour right away. All over the place. And this record came out great." Teitur has some tour dates coming up in October and November in Europe. Looking forward to hearing the new album and hopefully catching Teitur live in the near future. 1. The host was horrible, she shouldn't be allowed on TV let alone have her own talk show. 2. Pity most of the performances where lip-synched with a snippet of live microphone here and there. 3. Florence and the Machine were okay, I guess I just don't really like the song (at least she appeared to sing live). "VMA's psych 101 - interesting that Taylor Swift wrote a forgiving song about @KanyeWest and @KanyeWest wrote a song about @KanyeWest also :)"
Really looking forward to the new Human League album. The title of the ninth studio album and new single from synthpop legends will be revealed on Monday September 20th. Just came across a cool synthpop band out of the U.K. called Tenek. The duo has just released a new cd titled "On The Wire" and I'm really enjoying it and featured three songs from the album on my radio show this week. I've been a big fan of Starsmith and a lot of the remixes he has done, and his song "Love In Two" was pretty good. I have to say his new single "Give Me A Break" just isn't that great, and if that is the direction he's going in I likely won't be buying his debut cd, pity. Alphaville are back with a new single "I Die For You Today" and an album titled "Catching Rays On Giant" due out October 22nd. I was looking for a few of the Graham Hurley Detective Faraday books I need to read to complete the series and came across a store selling the blood orange soda pop "Tru Blood". This is an HBO product of course tied in with the True Blood television series now in it's third season. 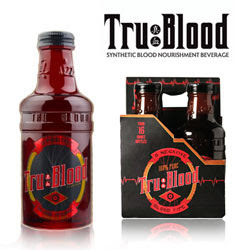 In the show vampires can buy bottled blood called Tru Blood. These soda pop bottles are done up just like the ones in the show. The bottles aren't cheap, $5.75 Canadian for one bottle (you can buy 4 packs there also). The store selling Tru Blood is United Book Stores at 347 Mountain Road in Moncton New Brunswick. Once I try the soda I will add what I think of the taste.